Charter Oak Mechanical is a top heating contractor serving homes and businesses in East Hartford CT. In less than a month, it will be Autumn, and nighttime temperatures are going to dip into the forties. If your home heating system is over 25 years old, it may not be performing up to energy efficiency standards of today. As the snowy season approaches and winter settles in, you want the peace of mind that comes with a reliable heating system. 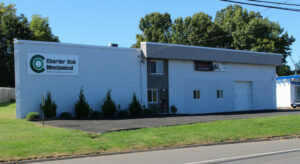 Charter Oak Mechanical is the premier heating, ventilation, air conditioning, and refrigeration specialists covering the state of Connecticut. We have served the greater Hartford region for over 25 years and have a reputation for service excellence. Our technicians are thorough and professional. At the very least, consider having your heating system inspected for efficiency and have your furnace cleaned regularly. Ask about signing up for a Charter Oak Mechanical service contract. We regularly get five star reviews (visit our Facebook page) and customers rave about our great service, friendly staff, and expertise. Charter Oak Mechanical can service your home or commercial business anytime and we stand by our work with our guarantee. Charter Oak Mechanical Services strives to ensure 100% customer satisfaction. No matter what your home’s needs, give us a call today at 860-432-8915 to see how we can help!